Uterine fibroids are growths that originate in or on the uterus, specifically the smooth muscle of the uterus or myometrium. Fibroids typically develop during child-bearing years with up to 75% of women suffering from the growths during their lifetime. Fibroids start as a single cell that divides multiple times creating a mass of cells. There are few definitive rules in regards to growth, size or shape of fibroids. In some women, the cells divide rapidly and consistently causing a large growth that distorts the shape and size of the uterus. In other women, the growth grows slowly or grows to a specific size then stops growing all together. Fibroids range in size from extremely small (the size of a seed) to extremely large (pushing the uterus up near the ribcage). Fibroids that develop during pregnancy may disappear after pregnancy when the uterus shrinks down to pre-pregnancy size. Fibroid growth is individual to the patient and may change over time. Some women experience no symptoms with fibroids remaining undetected until a pregnancy ultrasound or pelvic exam with other women experiencing symptoms that affect menstrual cycle and ability to conceive. Fibroids can go through growth spurts with periods of inactive growth between spurts. The majority of fibroids grow on the uterine wall, but they can also grow outside the uterus or in the uterine cavity. There are three main types of fibroids based on where the fibroid grows. Subserosal: Subserosal fibroids grow on the outside wall of the uterus creating a knob or bump. Some subserosal fibroids grow a stack extending the fibroid out from the uterine wall. These fibroids are referred to as pedunculated fibroids. Intramural: The intramural fibroids grow within the uterine wall. Growth can cause bumps or nodules in the uterine wall. At times, growth pushes into the uterine or endometrial cavity. If growth breaches the uterine cavity the intramural fibroids then becomes a submucosal fibroid. 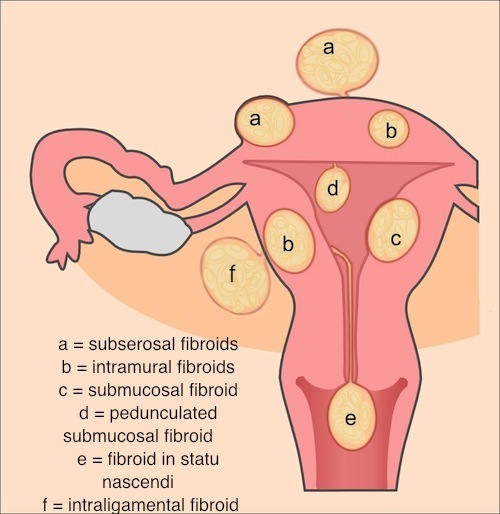 Submucosal: Submucosal fibroids are the rarest form of fibroids. They grow from the lining of the uterus into the uterine cavity. Large fibroids can block fallopian tubes making it more difficult to become pregnant. Fibroids are common and while they can cause heavy bleeding, pain and infertility, not all women experience symptoms. Depending on the symptoms, a patient could be asked to wait and watch fibroid growth, take medications to control menstrual symptoms or undergo surgery to remove fibroids.